7But when he saw many Pharisees and Sadducees coming for baptism, he said to them, “You brood of vipers! Who warned you to flee from the wrath to come? (1) The words of Mr. Potter in the Christmas classic--"Oh, confound it, man, are you afraid of success?" --suggest themselves when I read about John's reactions to the Pharisees and Saducees interspersed among the crowds who came to see them. Most preachers would probably lap up the success that John enjoyed. But John wasn't about success; his mission was to prepare a people to welcome the arrival of the long-promised King of kings! He doubted the sincerity of the Pharisees and Saducees. (2) In calling the Pharisees and Saducees a "brood of vipers," John was clearly suggesting a link between them and the serpent who tempted Adam and Eve in the Garden of Eden. Luke 3:7 quotes John as calling them, "children of vipers." This is a bit like Jesus' words to his fellow Jews in John 8, where he accuses them of being not children of Abraham, but of the "father of lies," Satan. The NIV has "coming to where he was baptizing," using epi in its more common meaning to denote a place "on" or "upon". Thus they came to the place of his baptisms, but not to be baptized. More likely they came for critical observation. Carter (Matthew and the Margins) goes a step further and notes that epi can mean "against". Thus the Pharisees and Sadducees are coming against his baptism. Thus Matthew already sets these religious authorities against God's purposes. Our translation, the New Revised Standard Version translates the passage differently, saying that there were "many Pharisees and Sadducees coming for baptism." Who's right? I don't know. But clearly, John doesn't think that the Saducees and Pharisees (and maybe others) were genuinely repentant, wanting to prepare for the coming of the Messiah. 8Bear fruit worthy of repentance. 9Do not presume to say to yourselves, ‘We have Abraham as our ancestor’; for I tell you, God is able from these stones to raise up children to Abraham. 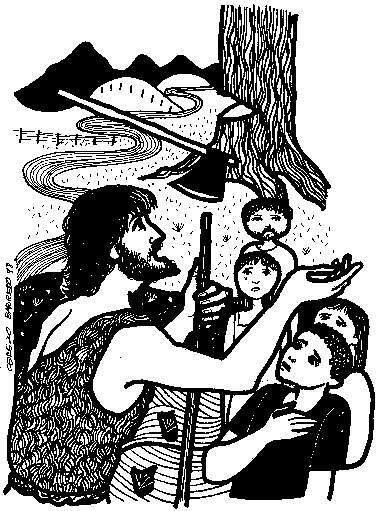 10Even now the ax is lying at the root of the trees; every tree therefore that does not bear good fruit is cut down and thrown into the fire. (1) Back to the tree imagery of the Isaiah passage and the verses in that book immediately preceding it. Repentance is more than sorrow for sin and it's meant to be an ongoing feature of our lives, a constant return to God, Who fills us with life that results in God's presence evidenced in our living. (2) Being a child of Abraham has nothing to do with genetics. It has everything to do with faith. As both Genesis and Romans says of Abraham, "Abraham believed and God reckoned it to him as righteousness." 11I baptize you with water for repentance, but one who is more powerful than I is coming after me; I am not worthy to carry his sandals. He will baptize you with the Holy Spirit and fire. (1) John draws a distinction between his baptism and the one that Christ will institute. There will be more on this in my sermon, which I hope to publish tomorrow. (1) Jesus is no Mister Rogers in a bathrobe. He will allow those who have walked away from Him to keep walking. But those who are repentant--who turn back to God--will be with Him forever. A version of what became Dwight Eisenhower's 1952 campaign slogan existed in the late-1940s. In an Irving Berlin Broadway musical of that period, after Eisenhower had become a national hero for his work as Supreme Commander of Allied Forces in Europe during World War II, an ensemble sang a satirical overview of prospective 1948 presidential candidates, finding each deficient but one. "We like Ike," they sang. Born ten months after Eisenhower was inaugurated as President in 1953, he's the first President I remember. In the summer of 1959, when I was five-and-a-half, I was already intensely interested in history and politics and my parents decided to take me to Washington, D.C. for the first time. I liked Ike and when we went to Washington, I was sure that one day, as we sat at a dime store luncheonette counter blocks removed from the White House, Ike would walk in, grinning that trademark smile of his, and have lunch with us. It didn't happen, of course, but I still liked Ike. In part, my affection for Eisenhower was inherited. My dad revered him. One of his fondest memories is of the day he briefly met Eisenhower. Dad was stationed in Germany, an Air Force staff sergeant. Ike, dressed in civilian attire, preparing to return to the States to make his first run for the presidency in 1952, was on base. He wore a brown suit and a smile that looked like a million bucks as he shook my father's hand. 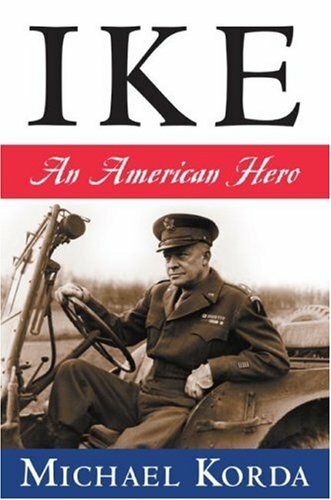 Michael Korda's newest book, Ike: An American Hero, spends a good chunk of its 720-pages discussing Eisenhower's European command during World War II. It spends a scant chapter-and-a-half on his presidency. This isn't because, as has become popular these days, Korda disdains Eisenhower's time in the White House. On the contrary, Korda is even more complimentary of Ike's Oval Office tenure than was the late Stephen Ambrose, who accords Eisenhower something like idolatry as opposed to Korda's laudatory, but balanced view. But, as you read Korda's telling of Eisenhower's life story, it's difficult not to consider the possibility that some unseen hand was guiding Ike to his command in Europe. It was the service he seems destined to have rendered, playing a critical role in ridding the world of Hitler's evil. That, in turn was the event which won Eisenhower the fame that would send him to the presidency. Korda, like Ambrose, chronicles the critical internships Eisenhower served through a long, often frustrating, military career, under people like MacArthur, Fox Conner, and George Marshall. One insightful West Point faculty member apparently diverged from others who looked at Eisenhower. Ike, he concluded when Eisenhower graduated from the Point, "was born to command." Conner and Marshall, at least, seemed to see this same quality in Eisenhower. MacArthur, ever consumed with himself and his own reputation, relied heavily on Eisenhower, but never seemed to consider what Eisenhower might do as a commander himself. Conner was especially influential on Eisenhower, schooling him deeply in history and strategy, acting as a reassuring father figure at a critical time for both Ike and his wife, Mamie, immediately following the death of a beloved son. One experience after another in Eisenhower's lengthy Army career prepared him for World War II. More than anything, in spite of being kept stateside during the First World War, because he was regarded as a great trainer and organizer, Eisenhower became the preeminent logistician of the Army. George Marshall, chair of the chiefs of staff in Washington, knew this and when the Japanese attacked Pearl Harbor on December 7, 1941, Marshall called Ike to Washington to piece together the rudiments of US strategy and recommend how to make it work in this new war. Ike came to know more about US industrial capacity than anyone in the country. Korda shows that Eisenhower was more than just a "military man," as some disdainfully say. Like our other greatest generals--Washington, Grant, and Powell, among them--Eisenhower had a deep respect for the limits of military force, of how it should be employed for purposes established by civilian authorities. He believed that if and when it became necessary for the United States to enter a war, it should do so with defined purposes and with a gathering of all the power that could be mustered. Later in life, for example, he thought that it was a mistake for the United States to go to war in Vietnam. But once John Kennedy and Lyndon Johnson put the country into the war there, he deemed it idiocy to hamstring the military only to be defeated and humiliated. Eisenhower was also a well-rounded person, schooled in history and practical diplomacy. All these attributes helped him during World War II. Korda's abbreviated overview of Eisenhower's presidency is a bit disappointing even though I understand he regarded it as a coda to Ike's military career. He does however manage to convey the message--with which I agree--that Eisenhower was a much more successful President than he's often credited with being. After ending Truman's war in Korea, with a combination of subtle diplomacy and implied military threats, Eisenhower, which the record now shows was far more hands-on than was thought while he was President, kept the US at peace during the height of the Cold War. This is more than his immediate successors could claim. Korda, credibly, gives Eisenhower more credit for Civil Rights than other biographers--or I--have previously. Eisenhower, Korda argues, was more interested in results than histrionics. After Truman integrated the military, segregation remained much intact on military installations in the South. Eisenhower changed that. He also pushed through the first Civil Rights law since Reconstruction. Eisenhower made mistakes, to be sure. He took Richard Nixon as his Vice President in 1952, in order to shore up his reputation as being firm in his opposition to Communism. Insensibly, Ohio Senator Bob Taft and his fellow crazies in the Republican Party, blamed Ike for not marching into Berlin at the end of World War II (though it made no strategic sense and had nothing to do with the aims and goals of the conflict) and for being "soft on Communism" because he had consulted with Joseph Stalin, the dictator of the Soviet Union, with which the US was allied during World War II. But Ike never liked Nixon and wanted to dump him from his ticket in 1956. Shaking Nixon would have entailed overtly going after him, something Ike didn't want to be seen doing. Eisenhower regretted nominating Earl Warren to be Supreme Court Chief Justice. But, according to Korda, he was as committed to civil rights as Warren and bound in any case to uphold the Court's decision, by virtue of the Constitution. If one word, above any others, describes Eisenhower, I'm sure Korda would say, it's duty. He felt a strong sense of duty to his country and to the Constitution. He pursued that duty with uncommon diligence. There are flaws in Korda's book. His sentences can be overly long, interrupted by circuitous comments bracketed by parentheses and hyphens, a flaw to which I myself am prone. Disappointingly, the book is filled with editing errors. Missing words, added words, and lost punctuation abound. This is incredible in light of the fact that Korda himself served for years as an editor with a major publishing house. He was not well served by the editor who he thanks here. I also would like to resolve the decidedly different view of Korda when it comes to the relative abilities of American and German troops to improvise in what von Clausewitz called "the fog of war" or after superior officers died. Ambrose insisted in his book, Citizen Soldiers, that Americans were better at this than the Germans because of the nature of American life: egalitarian, improvisational. Korda argues that the Americans were lost when their superiors died and they were left to fend for themselves, but that the Germans remained cool, able to keep fighting. The results of the war suggest that Korda is wrong and Ambrose is right. But, as Korda convincingly argues here, as grateful as we all should be to the "greatest generation" for their service during World War II, the success of the Allies, under the leadership of the United States, had more to do with the strategies and generalships of people like Eisenhower--not to mention the leadership of Franklin Roosevelt, who set the mission and the goals, but gave great latitude to his subordinates, including his military subordinates--and with the enormous industrial capacity of the US. I read most of this book by myself. But I read some of it aloud to my wife as we traveled around recently. I finished it on Thursday, on a drive to Cincinnati, for a day trip. As I closed the book on the final chapter, I told her, "I'm going to miss spending time with Ike in this way. I wonder if we'll ever see his like again?" Probably not and that's okay; we don't need copies, but originals. A few days after Eisenhower died in 1969, a local department store ran a tribute to him in the Columbus newspapers. There was a simple picture of Eisenhower in civilian attire. Above him was a quote from Shakespeare's Twelfth Night: ""Some are born great, some achieve greatness, and some have greatness thrust upon them." At the time, I remember thinking, what are they saying about Eisenhower? Which of these are they saying was true of him? Was he born great, an achiever of greatness, or one on whom greatness was thrust? That Eisenhower was ambitious, maybe even for greatness, Korda makes clear enough. But Eisenhower never seemed to define that as soaking up the limelight. He was, mostly, devoid of ego and was instead, dutiful. He wanted to do great things far more than to be regarded as great. Greatness was clearly thrust upon him, moving from Colonel to Five Star General in four years. If not born great, he was nurtured for greatness by parents who, contrary to the norms of the time, were both college educated and believed that their children's futures were filled with God-given possibilities. Ike's pacifist mother was probably never happy with his career choice. But she had a lot to do with shaping him to be the kind of general, the kind of president, and the kind of man he became. However Ike's greatness came, he was undeniably a great man and the world was fortunate to have him when he came along. I like Korda's book. And I still like Ike! 12. For general comments on the book of Romans, go here. Paul has told his readers that “We who are strong” (v. 1) are to help the “weak” to come to terms with their consciences; we are to endure, pleasantly, their “failings” – thus building up the Christian community. Jesus is our great example. Now Paul tells us the value of the Old Testament for us, “written in former days” (v. 4). When Jesus’ suffering is seen as part of God’s plan (which began with Abraham and other patriarchs) “the scriptures” take on a greater meaning: towards the “hope” of eternal life. Vv. 5-6 are a prayer for harmony in the community, so that it may reflect God’s glory. In 14:1, Paul has written: “Welcome those who are weak in faith”. In v. 7 he combines this with Jesus’ command to “love one another as I have loved you”. Why? “For the glory of God”, the reason Jesus came to us. Jesus was a Jew and ministered to Jews (“a servant of the circumcised”, v. 8) in order to demonstrate that the “promises ... to the patriarchs” are reliable (“confirm”) and to open up God’s promises to other cultural communities (“Gentiles”, v. 9, Greek: ethne). Paul’s quotations in vv. 9-11 – from Psalms, Deuteronomy and Isaiah – all show that others besides Jews were envisioned in God’s plan. Paul ends by asking God, the one in whom all cultures centre their “hope” (v. 12), to fill his readers with “joy” (v. 13), “peace” and “hope” – the key concepts in his quotations. (1) The word for "appeared" here is paraginomai in the Greek of the original text. It's an interesting word to me, because it's a compound. Ginomai, by itself, means the same thing: to appear. Para is a prefix familiar to us in English, found in such words as parallel, paradox, and parable. It carries the meaning of alongside. For example, parallel carries the meaning of two lines traveling alongside one another, whether in reference to the gymnast's parallel bars or the geographer's parallels of latitude. A parable, which might literally be translated as thrown alongside is a story which, parallel to it, has another story. So, I wonder if it would be pressing things too much to say that a more specific way to speak of John's appearing in the wilderness is to say that he appeared alongside or in the midst of his Judean people. This would get at some of the nature of his ministry. He came alongside his fellow Judeans to prepare them for the appearing of the long-awaited King of kings. (2) The place of John's ministry, the eremos, the desert or wilderness, is fitting. The second of the two Creation accounts, which begins at Genesis 2:4, happens in a wilderness or desert. It was from the dust of this wilderness that God breathed life into the first man. The wilderness was also the place where the people of Israel wandered, taking forty years to make what should have been an eleven-day trip. And, of course, Jesus was tempted in the wilderness. The meaning is both literal and symbolic. The wilderness is a hard place to live, a place where death is at home. The devil too, found this a hospitable place, apparently. (1) Repent, metanoia in the Greek of the New Testament, literally means change of mind. To repent means to undergo what I sometimes call a holy lobotomy. We change our way of thinking. Born enslaved to sin, repentance, in a way, is asking God to help us think about our life, about sin, and about God in God's ways. This is what Paul describes when he encouraged the Philippian church (and us) to "Let the same mind be in you that was in Christ Jesus..." (Philippians 2:5). Hebrew, pictorial and earthy where Greek is cerebral, uses a word which carries the meaning of once having been walking away from God and then turning back. (2) The phrase kingdom of heaven is the way Matthew translates words of Jesus that might be rendered as kingdom or kingdom of God in the other Gospels. All three versions convey the idea of God's reign entering our wilderness through Christ. In fact, the word for kingdom, basileia in the Greek, is more accurately translated as reign. A kingdom is more about a confined piece of geography. But to speak of being under the reign of heaven or the reign of God is to speak of something that can happen anywhere people repent and believe in Jesus Christ. It has to do with submission to the lordship of a king rather than residence in a place. It has to do with a relationship with one's Lord. (3) John says that the kingdom "has come near." He speaks of Jesus' entry into the world as an accomplished fact. And so it was. John was preparing others--and, it turns out, himself--to see the King Who has come near. At Christmas, we celebrate the miracle of grace involved in God coming near to us! Only Matthew gives us a direct quote of John's preaching: "Repent, for the kingdom of heaven is near." These are exactly the same words Jesus speaks in 4:17, and quite similar to the words his disciples are to proclaim in 10:7. (1) The words quoted are from Isaiah 40:3. They said that God was going to deliver His captive people. In Jesus, God sets those who are repentant and believe in Him from their captivity to sin and death. (2) Preparing the way, making paths straight. This is the imagery of road construction. While the Gospel of Luke makes much more extensive use of this imagery from Isaiah, the idea is here as well. John's ministry of preparation entailed clearing a path by which people could see that Jesus is the King. building, it clears a way, in this case so that people to see forgiveness beyond sin and hope beyond death. That's what they see in Jesus. 4Now John wore clothing of camel’s hair with a leather belt around his waist, and his food was locusts and wild honey. (2) John wasn't interested in all the things that denote status in the world. He understood that it's possible to gain the world and lose one's eternal life. He made seeking God's kingdom the first priority in his life. 5Then the people of Jerusalem and all Judea were going out to him, and all the region along the Jordan, 6and they were baptized by him in the river Jordan, confessing their sins. (1) What accounted for the attraction that people felt to John and his message? It had nothing to do with his attire or his diet. It had nothing to do with the easiness of his message either. 8. Psalm 72:1-7, 18-19: This Psalm is attributed to King Solomon, son and successor of King David. At the beginning of his reign, Solomon impressed God by asking not for wealth or power, but wisdom. The Old Testament records that God gave this gift to him, enhancing his rule. But, tragically, Solomon became mesmerized by power and wealth. Without quesiton, Solomon was the most powerful of Israel's kings and the wealthiest. But his reign also was also characterized by a tolerance of idol worship that compromised Israel's faith and because it was completely dependent on God for its life, its security as well. 9. The Psalm describes, as the Life Application Bible puts it, "the perfect king." Christians have long associated these words with Jesus, the Perfect King. This equation of righteousness with justice (and what that means) is seen in the next three verses, where we see what the scholars call incomplete parallels, places where not the exact, but similar terms or images are used to drive home a point about the "perfect king." From this, we derive the conclusion that the King stands for all unable to stand for themselves. Liberation theology says that God has a preference for the poor. That may be. But it isn't just the financially poor for whom God stands. We shouldn't forget that the founding patriarch of God's people was Abraham, a wealthy man. There's a sense in which all are poor and God is for those who have been made weak by sin and death and are in need of the perfect king, Jesus the Christ. 10. Verses 18 and 19 of the Psalm underscore that even this description of the perfect king really isn't about the king. It's about the God Who gives this king to the world. 11. The Psalm ends with the words, "Amen and Amen." Amen means Yes! or Let it Be! It's a way of affirming that what has just been said is true and desired. Whenever our modern translations of the New Testament quotes Jesus as saying, "Truly, I say to you..." or "Truly, truly...," it's translating the words from the original text in which Jesus says, "Amen, amen..."
When we say "Amen" at the conclusions of our prayers, we're not saying, "Over and out," but "Yes, I'm bringing these things to You, God, and I'm sure that You will respond to these prayers as You see fit. Your will be done." Similarly, when we confess our faith and we close our confession with, "Amen," we're saying, "This is precisely what we believe!" Back when I was a new pastor, called to serve a church in northwestern Ohio twenty-three years ago, God blessed me big time: A pastor named Ron Claussen was serving a neighboring parish composed of two congregations, each about three miles from me. The day after I arrived on the scene, Ron visited and encouraged me. Before leaving that day, he gave me the best advice on being a pastor I've ever heard. "Love the people," he said. This was a needed call away from self-absoption and toward servanthood which, in my better moments, still informs my life, not just as a pastor, but as a human being. Over the next six years, whenever I was disappointed that I wasn't proving to be the Lutheran version of Billy Graham, packing them in Sunday after Sunday, or whenever the grey winter skies, so prominent on the flat farmland of that reclaimed swamp land, surrounded me, my wife co-conspired with Ron. She called him up and said, "Ron, it's time." Unaware of their conspiracy and amazed by the providential timing, I'd get a call from Ron, who asked, "Want to go out to lunch today?" Because of his listening ear and his solid Biblical counsel, I always felt better after those lunches! The area where we served in northwestern Ohio included the most-heavily Lutheran county in the United States, Henry County. (The building facilities of the church where I served as pastor, Bethlehem Lutheran Church of Okolona, Ohio, set on the line between Henry and Defiance Counties.) We used to joke that you couldn't spit without hitting a Lutheran there and Lutheran church buildings dotted every hamlet and just about every other country road. Each congregation was close to being packed to the rafters on Sunday mornings. Because there were such strong ties among those churches and because, unlike the rest of us, Ron had taken the time to figure out how everyone in a four-county area was related to each other, he was known and beloved by every member of every one of those churches. We pastors thought of Ron as our "bishop" and of ourselves as his assistants. But it wasn't just the Lutherans who sensed the powerful presence of Christ and His love in Ron. Congregations of several different denominations facing pastoral vacancies schemed to cajole Ron into becoming their pastor. He also had an easy way of relating to non-churchgoing people, an authentically friendly manner that earned their confidence and their trust. Ron has retired and now confined to a wheelchair as the result of being victimized by polio back in 1952, he still is loving the people. He has an active email ministry and last year, wrote and published What? God...You Want Me To Do Something? I heartily recommend What? God...You Want Me To Do Something? to help you or someone for whom you purchase it as a gift to grow in faith. It's composed of 52 weekly devotional pieces that each conclude with a challenge to the reader to compose their plans for living the devotion over that seven day period. The devotions, in other words, are a lot like Ron: A terrific communicator of the Good News of Jesus Christ, his living has nonetheless always been his greatest witness. Ron now has another project to help you grow in your faith. It's an audio CD of seventeen devotions based on the New Testament book of James. It's called Count It All Joy! James has had a sketchy reputation among we Lutherans ever since Martin Luther wrongly dismissed it as an "epistle of straw," worthy of being burned and of excision from the New Testament. Fortunately, we Lutherans lived up to our reputations as people of God's Word and didn't follow Luther's advice. (Neither did he, by the way.) So, it's great that Ron has chosen to use it as the basis for the inspirations on Count It All Joy! While I haven't heard Ron's new CD yet, I can well imagine that it will be well worth your money, not to mention the time spent in listening to it. Ron's faith is rooted in God's grace. But he also has a passion for the subject of how we respond to God's grace, how we go about living each day in ways that please God and let others experience His grace. In addition to being major themes of Ron's ministry, they're also major themes in the book of James. You can order either What? God...You Want Me to Do Something? Or Count It All Joy by going to this link, printing the order form, filling it out, and sending it to the surface mail address mentioned there. 1. This week brings us to the Second Sunday in Advent. The Gospel lessons for both this Sunday and next surround the prophetic ministry of John the Baptist. In fact, the Old Testament lesson for this week presents prophecy of a Savior. In the Romans passage, Paul underscores how Old Testament scripture was written to impart hope, hope that was ultimately fulfilled in Jesus. 2. Isaiah 11:1-10: I mentioned last week that Isaiah may be divisible into two or three sections, written at different times. The words in the lesson appointed for Sunday were written shortly after Tiglath-pileser III became king of Assyria in 745 BC. His intent was to be a conqueror and he had his eyes on Israel. Isaiah's prophecy sees the Assyrian king as a potential means by which God will punish Israel for its faithlessness to God. 3. But as is characteristic of the Old Testament prophets, Isaiah doesn't end with desolation. This Sunday's lesson tells us that God will send a Messiah, an anointed king. This imagery makes the beginning of our lesson all the more interesting. Isaiah says that a shoot will emerge from the stump of Jesse. Jesse, you know, was the father of David, Israel's greatest king. It was the Davidic line that was to reign on Israel's earthly throne. That promise was disrupted by the greed for power and wealth that resulted in the split of Israel from Judah. In effect, the Davidic line was cut down. But, Isaiah says that a new shoot, the Messiah, will appear. 5. Ralph Klein, of Lutheran School of Theology in Chicago, points out that the king foretold by Isaiah "will have a seven-fold gift of the spirit--the spirit of Yahweh, of wisdom and understanding, of counsel and might, of knowledge and the fear of Yahweh." Klein goes on to point out, "This future and ideal king will be a righteous administrator of justice, as was expected of all Israelite kings (Ps 72:12-14) and of all royalty in the Ancient Near East in general. He will not be influenced by bribes or by those of wealth or high station (v 3); he will have a preferential option for the poor (v 4a); and he will announce harsh verdicts on the arrogant wicked (v 4b)." 6. Isaiah 11:2 is similar to the prophecy in Isaiah 61:1-2, which Jesus reads and applies to Himself in Luke 4:18-21. One of my jobs after I graduated from college was management trainee at a paint store. Shortly after I started there, the manager went on a two-week vacation, leaving me in charge. I was assisted by a guy loaned from another store. The first week was exhausting. But it went well. On Saturday night, we closed the place down and had Sunday off. We returned at 6:45 on Monday morning, ready to open the place for contractors. We knew things were amiss the moment we walked in. Things just didn’t seem right. We realized our suspicions were warranted when I tried to get the money for the cash register. The money we left on Saturday was gone. It turned out that a disgruntled former employee still had keys and codes, got into the place on Sunday, and took the money. He was nabbed on Monday afternoon. There are several lessons this incident taught me, I guess. But being a bright guy, here’s one of the main lessons: Thieves never call ahead; they just show up. Wise businesses and homeowners prepare for thievery before thieves show up. Dead bolts and security systems are engaged. Cash is deposited in the bank. Locks and codes are changed so that disgruntled former employees or occupants can’t waltz in and take whatever they want. In a fallen world in which even the best of people sometimes do bad things, you have to be prepared. Advent is a time of preparation for all of us. In our homes, December is a time of almost frenzied preparation. Gifts are bought, travel plans made, Christmas cards sent, special dishes baked and cooked. The kids rehearse for programs at church and school. On and on our preparations go. Hopefully, at this time of year we also prepare ourselves spiritually for the celebration of Jesus’ birth, the stunning moment when God took on human flesh and entered our lives so that He could take on a cross for us and rise from death for us. Jesus won’t call ahead. He’ll just show up. How can we be ready for His return? Methodist pastor Derl Keefer has looked at this text and I think, rightly identified three ways that you and I can be ready for Jesus’ return. First: We need to have the right priorities. A friend of mine and his wife were diagnosed with cancer within days of each other. They had different cancers. But each of them had to go through their treatment regimens at the same time. I’m happy to say that both of them have been in remission for several years now. But just as they were both starting to feel better and getting back to work, I had lunch with my friend. He went on to say that just before he and his wife were diagnosed with their cancers, she’d suggested that they needed to give God a higher priority in their lives. They’d started attending Mass more regularly. “But,” he said, “it was our cancer that woke us up.” And then, my friend looked at me from across the table to say, “No matter how this turns out, whether I stay cancer-free or it comes back, God will remain my highest priority.” If that weren’t stunning enough, my friend then said, “Getting cancer is the best thing that ever happened to me. It drove me closer to God.” Now, having cancer is never a good thing. But I understood what my friend was telling me. Cancer had left he and his wife feeling vulnerable. And from that perspective of vulnerability, they let God take a place in their lives He'd never occupied before. At another place in Matthew’s Gospel, Jesus tells us to, “seek first the kingdom of God and his righteousness...” To be prepared for the day of Jesus’ return, not to mention to prepare for anything else that life or death throws our ways, we need to have the right priorities. We need to let God have the top billing in our lives. The Christian prepared for Christ’s return is the Christian who’s about the Lord’s business. And we can be about the Lord’s business no matter what our work. Or even if we’re retired. In his book, Prayer, Lutheran pastor Ole Hallesby tells about the funeral of a man who had lived in a small, remote village in rural Norway. Hundreds came from many miles away. This was in the 1930s, when it wouldn’t have been easy to travel Norway’s country roads. That was remarkable enough. But what was even more remarkable was that the man, who lived to a good age, was born with a terrible disease that had confined him to a single room in the small cottage in which he had been born, his entire life. He had never gone to school, never been to the market or the local coffee house or gain elevator, never been to church. But as he lay in his bed, often alone for hours, this man had decided to be proactive. He would take on a ministry of prayer. So, he asked his family members to give him all the names of people with needs in his town. He prayed for them constantly and lives began to change for the better. Soon, the townspeople were coming to his room with prayer requests. They all talked about how close they felt to God in the presence of this gnarled and sickly man. Eventually, people from throughout the area came to his cottage so that he could pray for them and with them and give them godly counsel. There were adults in other towns and villages for whom he had been praying daily since they were born, although he'd never met them. An elderly woman I once knew prayed that her great-grandson would become a pastor. Unbeknownst to the little boy, she called him her "little preacher." That woman died and the little boy spent some time wandering far from God. But eighteen years after she passed away, her great-grandson began studying at a seminary. He stands before you now, the product of one woman's prayers, herself long gone, but her prayers lodged in the heart of our eternal God! Any follower of Jesus can be proactive about their faith. When we are, we’re prepared for Christ’s return. But for the Christian, any time Jesus comes to us, it’s a good thing--whether it's at Christmas, at our Baptism, in the bread and wine of Holy Communion, in the Bible, in the preached Word, during our times of celebration and our times of sadness, at the moments we die, or on the day of His return. It’s always good when Jesus comes to us! When I was a boy, I was a fan of The Lone Ranger, Zorro, and Batman. A common theme of all those shows was that people who were up to no good were always frightened by the masked men. Others had nothing to fear and always welcomed them. As silly and homely as it may seem, I think about those characters when I remember that the return of Jesus isn’t a fearsome thing for the Christian. It's a happy thing! Funny, but not true. Jesus is coming back and the sin of the world breaks His heart. It breaks His heart that many, if not most, of the world chooses to sleepwalk through life, to sleepwalk away from Him. But when Jesus returns on what the Bible calls “the Day of the Lord,” it will be a time of joy. We can be about the business of living today with the certainty that our lives with Christ lead to a joy that never ends! How can we be ready for Christ’s return? Or for the day when we will stand before Him in eternity? We keep Him and His kingdom as our highest priority. We live our faith proactively. We remain positive people, believing that the God Who comes to us in Jesus Christ is our Friend, our Lord, our Savior, our King. Amen!